Sponsons, on a Feathercraft kayak, are the urethane compartments filled with air that give our boats stability. They also stretch the deck and hull fabric of our kayaks, providing a necessary tension between the aluminum frame and the exterior skin. Like the top layer, the urethane components needed to create the sealed sponson chambers are welded together seamlessly. The sponsons of a Feathercraft can be blown-up with a few hard breaths; no additional hand or foot pump is needed. For patching a sponson, use an Aquaseal adhesive with a Cotol accelerant. If you plan on storing your Feathercraft kayak in its built format, always remember to release a portion of the air held in the sponsons. This is especially important if you are leaving your boat in the sun. 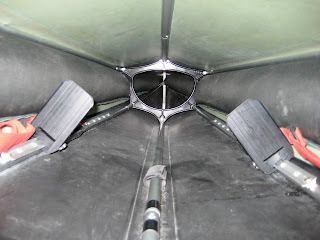 You can see the rounded sponson compartments on either side of the kayak, just above the foot pedals.